Apple Pie is really one of America’s best inventions. Whether its a warm evening in September, a family favorite to top off Thanksgiving dinner, or an elegant dessert for a special dinner party, this easy homemade apple pie can hit the spot perfectly. This recipe is different than an apple pie you will get at a restaurant or in the freezer at a grocery store. It’s made with tart granny smith apples, and a crumble topping. It is so juicy, it may not even keep its shape when you serve it, and it will leave your dinner guests asking to come back again. I don’t know exactly where my mom got this recipe, but I’m pretty sure it was from an aunt who called the topping “don’t tells.” I’m not sure if she didn’t want people to know how much sugar and butter was in it, or if she wanted to keep it her secret ingredient, but it is what really makes this recipe stand out in front of other apple pies recipes. Instead of another layer of pie crust on top, it is really more like, pie on the bottom and apple crisp on top. My mother in law has even tried it with oats in the topping. It makes the top of the pie sweet, crunchy and so delicious! 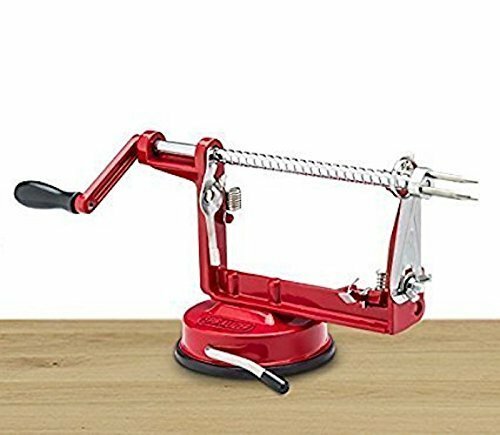 I love to use this Apple Peeler/Corer/Slicer from The Pampered Chef: it makes apple pie making so much easier and faster. You can also try this one: it’s about half the price of the Pampered Chef one and does the same things. And with over 1500 great reviews, you can’t go wrong. We also love using granny smith apples because they are juicy and tart. The combination of the sweet pie filling with sugar and cinnamon, and the tart granny smith apple really seals the deal with this apple pie. If you are one to like sweet and tart together, this combination will hit the spot for you. Top it with vanilla ice cream or whipped cream and it will be the best part of your day. Made with tart granny smith apples, and a crumble topping, this delicious apple pie is so juicy it may not even keep its shape when you serve it, and it will leave your dinner guests asking to come back again. Sift flour and salt; cut in shortening with a pastry blender until its the size of small peas. Sprinkle 1 tablespoon of water over part of the mixture and toss gently with a fork. Push aside and repeat until all the pastry is moistened. Form the dough into a ball and flatten it will your hand. Roll out into 1/8 inch thickness on a floured surface. Partially roll the dough onto the rolling pin and unroll it onto a greased pie pan. Cut the jagged edges off from around the crust then flute the edge. Put peeled and sliced apples in a bowl with all ingredients and mix them until well blended. Gently add them to the pie pan over the crust. Mix ingredients together with a pastry blender until they are crumb size. Sprinkle over the pie filling just before baking. Bake the pie for 50 minutes at 400 degrees.